If you are looking for information on the Nifty after Fifty franchise business opportunity, Nifty after Fifty franchises or Nifty after Fifty franchising, then you have come to the right place. It is easy to see why Nifty after Fifty Fitness Studio is on the launching pad of explosive growth. With over 76 million aging Baby Boomers in America, the demand for health and fitness products and services has never been greater. Nifty after Fifty is an organization poised and prepared for growth, in a nearly untapped market. America's 55+ population is expected to grow by 14 percent from 2010 to 2015, and by 14 percent again from 2015 to 2020. Most health care plans will not keep pace with rising health care costs. To stay healthy, America's seniors will aggressively pursue an exercise and wellness regimen. The $14.8 billion fitness industry has doubled in size in the last 10 years. 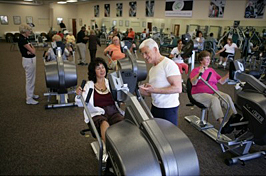 The largest growth in health club memberships has come from individuals 45 years of age or older. Customized workouts are the top fitness trend predicted for 2008 by the American Council on Exercise, the leading organization that certifies fitness instructors. More than half of the 33 million Americans who go to health clubs are over 40 years old - and this segment will grow as the population changes. Nifty after Fifty Fitness Studios are more than just a "Baby Boomer" health club. It's the most complete and effective fitness studio ever developed to achieve greater wellness and lasting independence for adults entering the second half of life. Our revolutionary approach to health and fitness for mature adults is unrivaled. We offer customized programs, services and products specifically designed to meet the needs of this growing demographic, and we have received an overwhelmingly positive response from our clients and the healthcare community. In addition to our customized health programs and services, Nifty after Fifty offers a private label skin care line and a line of active wear specifically designed for the over 50 market. It is easy to see why Nifty after Fifty is on the launching pad of explosive growth. With over 76 million aging Baby Boomers in America, the demand for health and fitness products and services has never been greater. Nifty after Fifty is an organization poised and prepared for growth, in a nearly untapped market. Nifty after Fifty is more than just a "Baby Boomer" health club. It's the most complete and effective fitness center ever developed to achieve greater wellness and lasting independence for adults entering the second half of life. High demand fitness programs and services in a rapidly expanding market. What is most astounding about our business is the tremendous development opportunities that exist across the nation. The market is primed and ready for our expansion by way of new franchisees. As the Baby Boomer generation ages, its members are taking a proactive approach to their health to achieve greater wellness and lasting independence. To meet this growing demand, we're targeting the addition of new locations across the nation. We offer an outstanding opportunity for qualified entrepreneurs who share our vision and want to reap the significant rewards. At the core of our franchise value system are three key principles. We encourage strong involvement from all franchisees in all aspects of our business. We are 100% committed to creating growth opportunities for all franchisees through unparalleled support. We constantly strive to develop supportive franchise partnerships through honest business practices. The business case is compelling. A Nifty after Fifty franchises is ideal for entrepreneurs seeking a business opportunity in the rapidly expanding health and fitness industry. And we are the only franchised business of our kind in the $70 billion health and wellness industry. In addition, our industry is expecting explosive growth over the next 30 years. With more Americans than ever taking a pro-active approach to their health, Nifty after Fifty is in a strategic position to capitalize on these trends. The need for health and wellness products and services has never been greater, and we provide our clients a perfect solution for greater health and lasting independence. We're seeking strategic franchise partners to help build and spread our success as part of this multi-billion dollar industry. Our ability to empower you has never been stronger. And our franchise support is second to none. We are proud of our niche market business concept and look forward to sharing some of the unique ideas, programs and specialized services that make Nifty after Fifty the right opportunity at the right time.